Roadmaps in business are nothing new. Companies use them all the time to communicate their strategic plans and to connect their missions, goals and tactics. 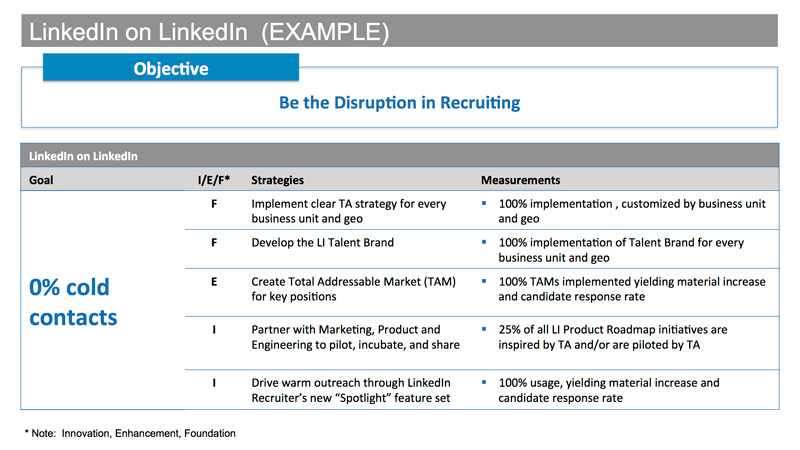 But what about recruiting functions: should they have roadmaps too? If you’re rolling your eyes, I get it. Five years ago I would have done the same. I would have said we didn’t have time for that fluff. We had real work to do. Sure, people were confused about who was doing what sometimes and projects often got messy, but we were getting by just fine thank you very much. Fast forward to today. 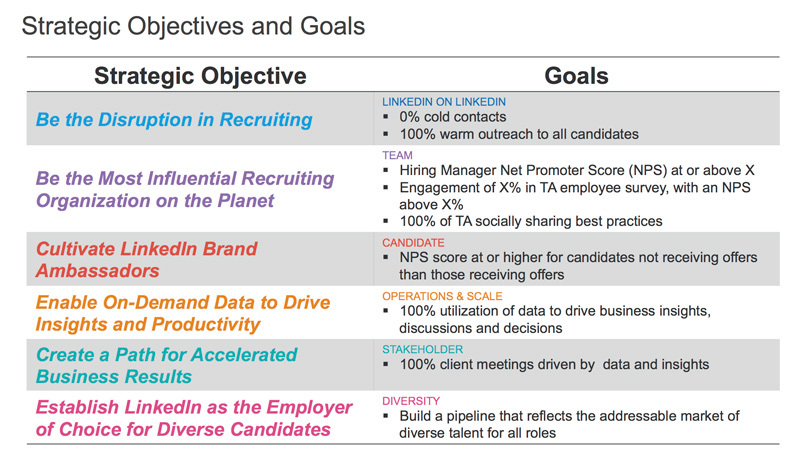 We have a Talent Acquisition roadmap at LinkedIn, and I see the magic. I see how much better our team performs now that there’s true cohesion and clarity around our business objectives. What’s more is that repetition in communicating our roadmap, vision, strategy and objectives has proven essential in creating organization momentum and a shared language of what success looks like for our team. 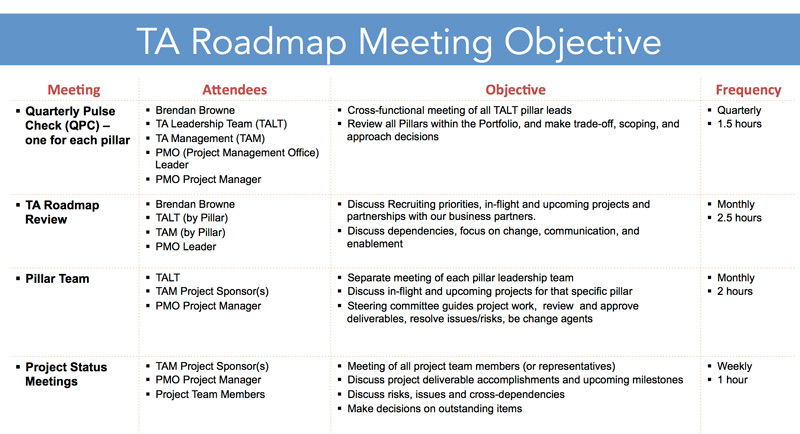 Our roadmap is the most collaborative and cross-functional way we've ever done work as an organization. I only wish we built it sooner. Several years ago we decided to apply the same degree of rigor to our TA function that our company leadership does to the LinkedIn enterprise. We wanted an operational model with more business acumen and sharper insights - one that could optimize our ability to recruit at scale. 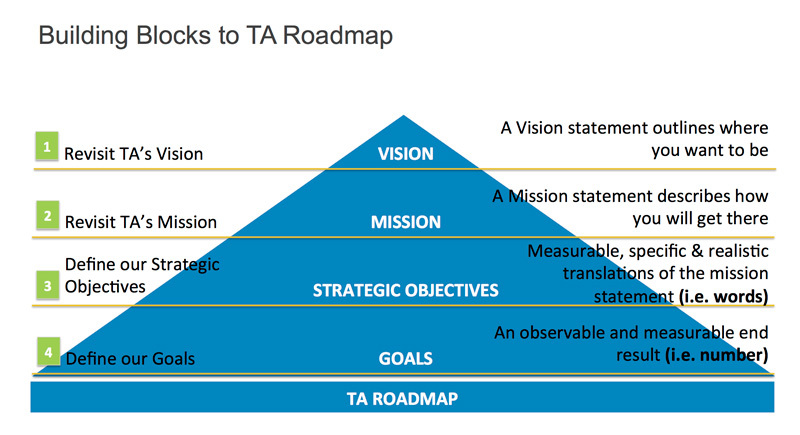 First, our leadership team revisited the TA vision and mission, the two highest-level statements. As seen below, we decided that our multi-year aspiration (vision) was to design, build, and share best on planet recruiting. 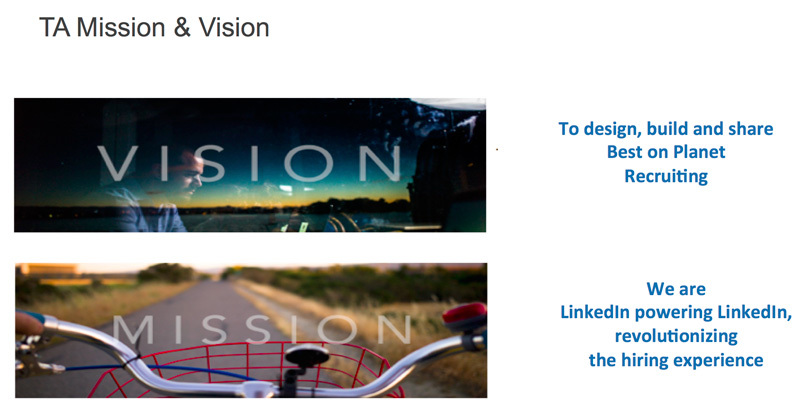 We planned to get there (mission) as LinkedIn powering LinkedIn, revolutionizing the hiring experience. Sounds nice, but for a mid-level recruiting manager in Singapore or a recent grad in EMEA, what do those statements actually mean and why should they care? So we drilled down further. We defined strategic objectives to support the mission. These six pillars are what make that high-level mission statement real and achievable. The picture was getting clearer, but we still weren’t there. So we kept pushing down to come up with measurable goals tied to each objective. From there we got even more granular. We developed a one-pager for each of the six strategic objectives, such as the one below. Huge bodies of work involving lots of people cascade down further from here. It took us weeks of working groups and brainstorming sessions to close on the core slides above. Part of the reason was because we included every manager from every region in the process. Empowerment and inclusion in the approach were essential. It may sound crazy to have 45+ people develop one document, but we found it was precisely what we needed to do to ensure success. It enabled us to capture more and better ideas, and when everyone had more skin in the game, getting buy-in was that much easier. In addition to outlining what we wanted to achieve and how to measure it, we also thought about how we wanted to show up as team members. We launched the following rules of engagement for the team at our first offsite as a standard that was bottoms up created by the team. We designed a social contract too. This agreement on how to behave aligns to and is a manifestation of our company values, but they are specific to Talent Acquisition. It is the cornerstone of our teamwork. In every TA manager meeting, for example, we start by sharing our “belonging” moments from the week before, based on Pat Wadors’ concept of DIBs (diversity, inclusion and belonging). These are the interactions in which individuals truly feel a part of something bigger than themselves. At our most recent leadership offsite, we decided to take the time to blow off some steam and reconnect with each other through an activity called Escape the Room - great team bonding activity to see who’s good at what and how we work together as a team. 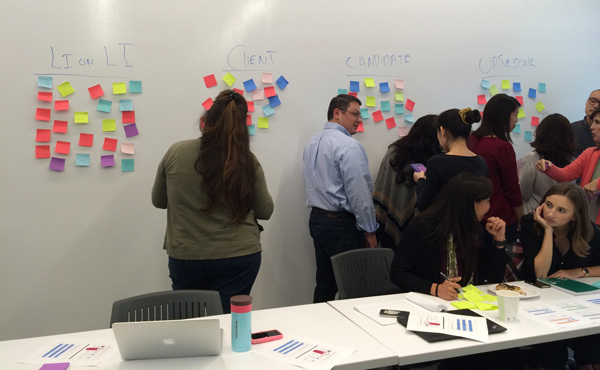 When two G&A recruiters moved to the R&D team because of an increase in headcount, the R&D team instantly welcomed them and partnered them with buddies to help them get acclimated to the R&D environment. Every day a TA leader leads the 3pm plank, a brief team workout that’s also a great chance to socialize. Since we started building the roadmap in August 2014, we’ve built or enhanced 16 tools that help our recruiters do their jobs every day. This TA toolkit empowers our managers to lead, equips them with insights for better decision-making, and creates consistent execution throughout the organization. Just like the roadmap, the toolkit was built by the team, for the team. Boosts morale: now that our team is clear on a strategy that they themselves built, everyone feels empowered and inspired. 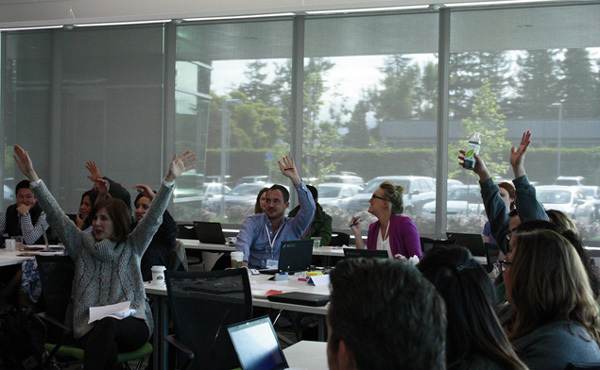 Fosters collaboration: By having a common language across our teams and regions, it simply makes working together easier. Demands excellence: When people know what to expect from their manager, their manager’s manager, and so on, they have built-in standards. These elevate the quality of quarterly reviews, one-on-ones, and every interaction in between. Improves nimbleness: The market is always changing, so we are constantly reprioritizing projects. The roadmap helps us articulate why and how we are shifting, and what the change means for a recruiter’s day to day. Because it encourages communication up and down, we manage change more easily, and thus move faster. Develops leaders: The roadmap guides and enables, but it leaves plenty of ambiguity and space for people to think critically and creatively. We’ve found that those who really embrace the roadmap as a management tool are accelerating in their careers. 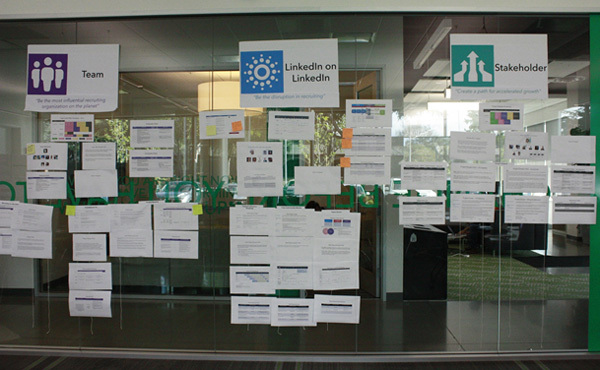 This roadmap works for us at LinkedIn, but it might not work for you. You may need a lightweight version, a one-pager, or something entirely different. But whether you’re a 10-person startup or a Fortune 500 company, don’t underestimate the impact of empowering others to own and solve the hardest problems. And surely don’t underestimate the power of putting language around what you’re trying to achieve, and then sharing it transparently, repeatedly, consistently at every level across your team.